Bring that restaurant-style chicken wing experience home to your own kitchen. These Parmesan garlic baked chicken wings are the result of trying to recreate a restaurant dish at home. We love wings! Even our 5-year-old requests we order them when we go out to eat, and the flavors they come in seem endless. The other evening, while at one of our favorite local spots, we ordered classic Buffalo wings and these Parmesan garlic wings. The wings at the restaurant were deep-fried and coated in a thick, cheesy, garlicy sauce. The little bit of fresh parsley on top was just enough to convince yourself that “at least you were getting your greens.” After a little coaxing of the server for the kitchen’s recipe… this was the result. Baked… not fried and just as good at room temperature as they are fresh out of the 400-degree oven. These wings are a huge hit with the family and I hope you love them, too. Preheat oven to 400 degrees F and line a baking pan with sides with aluminum foil. 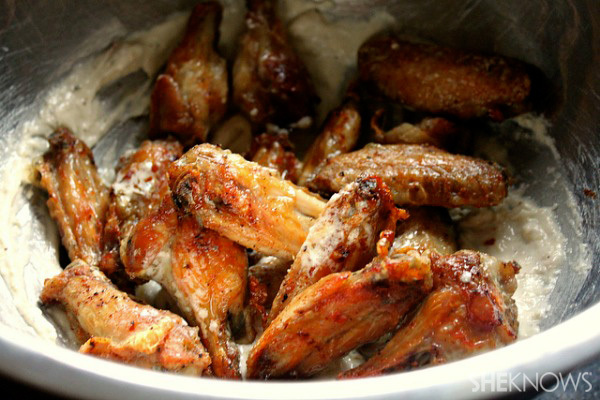 Place chicken wings in a large bowl and coat well with the vegetable oil, salt, pepper and garlic powder. Set aside. Meanwhile add garlic cloves (still in their skin) to a dry frying pan. Turn on the heat to medium-high and roast the garlic in the pan, turning often to roast all sides, until the skin is beginning to blacken and the garlic is soft, about 8-10 minutes. Remove garlic from the heat and extract the roasted garlic by simply squeezing it out of its skin. Place chicken wings in a single layer in the pan lined with the foil. Place in the oven for 40-50 minutes or until skin is crispy and brown. 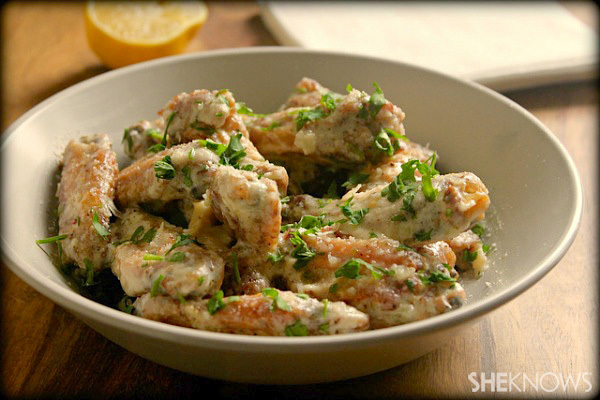 While chicken wings are baking, in a large clean bowl, add the roasted garlic, mayonnaise, Ranch dressing, Parmesan cheese, cream, oregano, lemon juice, pinch of salt and red pepper flakes. Whisk together well, smashing down the garlic while mixing. Taste and adjust seasoning only if necessary. When chicken wings are finished cooking, remove them from the pan and add them to the bowl with Parmesan and garlic mixture. 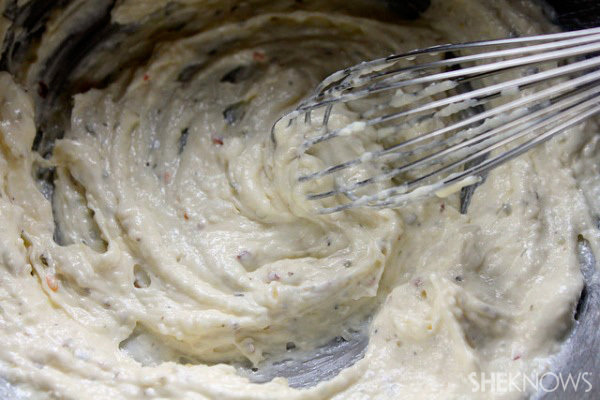 Toss well to coat the chicken wings with the sauce. Throw fresh parsley on top and serve.